Detroit Tigers infielder Don Wert watches Mickey Mantle circle the bases after hitting his 535th career home run, Sept. 19, 1968. America was not in the best of moods in the fall of 1968. The country was still convulsing from events near and far that would mark the year as one of the most tumultuous in the history of the 20th century. In late January, the Tet offensive in Vietnam, striking more than 100 towns and cities in South Vietnam, stunned the U.S. and South Vietnamese armies. Two months later, in late March 1968, President Lyndon B. Johnson, mired in the Vietnam conflict, announced he would not run for re-election. In April, civil rights leader Martin Luther King was shot and killed by an assassin, and in June, Bobby Kennedy, then running for the Democratic presidential nomination, was struck down by a gunman in California. In August, Soviet and Warsaw Pact troops crushed Czechoslovakia’s “Prague Spring.” Back in the states that month, the Democrats’ National Convention in Chicago became a spectacle of political ugliness, both inside the hall and on the streets, with clashes and confrontations over Vietnam and the nation’s future. But then, in the midst of all this, there was still baseball, the national pastime; the one constant thing; an oasis of predictable pace and familiarity apart from the turmoil. Baseball was there in those dark days, in the background perhaps, but doing its thing; playing its games, day after day, from April thru October. One of the game’s old lions at the time, Mickey Mantle of the New York Yankees, was nearing the end of his storied career. On September 19th, as the regular season was winding down, the Yankees were playing the Detroit Tigers in Detroit. The Tigers had already won the American League pennant that year, propelled there in part by ace pitcher Denny McLain, and were headed to the World Series. But in this game, Mantle hit his 535th home run, then putting him on the all-time homer list at No. 3, behind only Babe Ruth and Willie Mays. Mantle hit this homer off Denny McLain, who still picked up his amazing 31st win that year, as Detroit beat the Yanks, 6-2. It was Mantle’s 17th home run of the 1968 season — not the 30 or more he would normally hit each year during his prime. Mantle’s final career homer — No.536 — came the next day on September 20, 1968 off Boston’s Jim Lonborg. Mantle in those games, with his season-ending home runs, was in the last days of his career, though his official retirement announcement would not come until the following year, on March 1, 1969. These were his last games. 'Mickey Mantle: Born for The Majors,' cover story, Time, June 15, 1953. In later years Mantle would joke half-heartedly about his hobbled, late-career performance: “Hitting the ball was easy,” he’d say. “Running around the bases was the hard part.” Those who played with Mantle, however, knew it wasn’t funny. In the above photo, you can almost see him wincing as he ran the bases. Mantle had been a baseball sensation when he first came up in the early 1950s, a player with a rare combination of speed and switch-hitting power the game had not seen in years. Through the 1950s and early 1960s, he became one of baseball’s most feared hitters, and his speed on the base paths and in the outfield made him an all-around player, especially in his early years. Mantle played his entire 18-year career with the Yankees, winning three American League MVP titles. He was also selected to play on 16 American League All-Star teams. With the Yankees, Mantle played on 12 pennant winners and 7 World Series champions. As of 2007, he still held the records for most World Series home runs (18), RBIs (40), runs (42), walks (43), extra-base hits (26), and total bases (123). The Mantle legend, which began with his signing, grew during a special rookie camp the Yankees had…in 1950. There, some of the old-timers in the organization got a sense that they were seeing something rare; a true diamond in the rough. Mantle’s potential, his raw ability, his speed, his power from both sides of the plate, were almost eerie. If his talent were honed properly, they thought they were quite possibly looking at someone who might become the greatest player in the history of the game. There were some fast players in that camp, and one day someone decided that all the faster players should get together and have a race. Mantle, whose true speed had not yet been comprehended, simply ran away from the others. What had made some of the stories coming out of the camp so extraordinary was the messenger himself, Bill Dickey — the former Yankee catcher, a Hall of Fame player, and a tough, unsentimental old-timer who had played much of his career with Ruth, Gehrig, DiMaggio, and [Tommy] Henrich. He was not lightly given to hyperbole. Dickey started talking about Mantle to Jerry Coleman, the veteran second baseman, with superlatives that were unknown for him: “Jerry, he can hit with power righty, he can hit with power lefty, and he can outrun everyone here.”. . .
“He’s going to be the greatest player I’ve ever seen,” Dickey added. A few days later Dickey grabbed his old teammate Tommy Henrich. “Tom, you should see this kid Mantle that played at Joplin. I’ve never seen power like that. He hits the ball and it stays hit. He’s really going to be something.” Even the sound of his home runs, Dickey said, were different, mirroring something Ted Williams would say years later: the crack of the bat against the ball when Mantle connected was like an explosion. Henrich simply shook his head — it was one thing to hear about a coming star from an excited journalist, but quite another to hear it from someone like Bill Dickey. Some of Mantle’s teammates and competitors, as well as sports writers and fans, have often wondered what he would have been like had he not been plagued by injuries throughout his career — especially the leg injuries. Mantle had collected some of his injuries early in life, beginning with a leg infection as a high school football player that nearly resulted in an amputation. Still, when he reached the major leagues in 1951, his running speed was among the best in baseball and his power simply awesome. In his early career, some thought him a rare kind of baseball god, possessing both power and speed. In 1951, when Mantle was first coming up with the Yankees, his prowess was fully apparent. In an exhibition game at the University of Southern California during his rookie spring training season that year, batting left-handed, he hit a home run ball that left Bovard Field and crossed an adjacent football field, traveling an estimated 656 feet. Some cite it as the longest home run in baseball history. Mantle, in fact, hit two home runs that game — a second, right-handed shot cleared the left-field wall and landed on top of a three-story house well over 500 feet away. Throughout his career, Mantle would hit other memorable shots — including a 565-foot home run at Griffith Stadium in Washington in April 1953 (said to have coined the term “tape measure home run”); a 643-foot homer at Detroit’s Tiger Stadium in September 1960; and one that almost left Yankee Stadium, which no hitter has ever done. But those who saw Mantle hit during his rookie spring training year of 1951, remember the distinctive crack of the bat when he tore into the baseball; they knew there was something special about this “hayseed from Oklahoma,” as some called him. Mickey Mantle, 1950s. Photo by Bob Olen. But leg injuries plagued him from nearly the beginning of his Yankee career. As a 19 year-old rookie in his first World Series game in 1951, Mantle tore the cartilage in his right knee while running for a fly ball when his cleats caught a drainage cover in the outfield grass. His knee twisted awkwardly and witnesses reported him going down “like he had been shot,” hitting the ground instantly. He was carried from the field on a stretcher. Mantle would never play pain-free after that, but play he did — and play well. In 1952, he took over center field duties from retiring Joe DiMaggio, and completed one of his best seasons at the plate. But as the years went by, he would have knee surgery four times, and would apply thick wraps to both of his knees in something of a pre-game ritual. By the end of his career, simply swinging a bat caused him to fall to one knee in pain. Still, even with his injuries and impaired performance, Mantle managed to compile a record that most professional players can only dream about. During his career with the Yankees, he played more games as a Yankee than any other player (2,401), won three Most Valuable Player awards (’56, ’57 and ’62). In 1956, he won baseball’s Triple Crown with a .353 batting average, 52 homers and 130 RBIs. He led all of major league baseball that year in all three categories. His 536 career home runs was the third highest ever when he retired, behind only Babe Ruth and Jimmie Foxx, and the most ever by a switch-hitter. Mickey Mantle with U.S. Senator Robert F. Kennedy (D-NY) on Sept 18, 1965, ‘Mickey Mantle Day,’ when Mantle played his 2,000th game. Photo, Martin Blumenthal, SPORT magazine. Indeed, with two good legs, Mickey Mantle might have been a good bet to have broken Babe Ruth’s record of 60 home runs, and perhaps sooner than 1961 when Roger Maris did it. Mantle may have also compiled a career home run total closer to, if not exceeding 600. His career batting average would probably have bettered .300 as well; with more runs scored and RBIs up too, and perhaps a Gold Glove or two for fielding. All speculation, of course, and “what might have been.” Yet many of his admirers wish it could have been so; that the fair-haired kid from Oklahoma might have had a bit more luck with the health of his legs. Other stories about Mickey Mantle at this website include: “Mantle’s Griffith Shot, April 1953,” about a monster home run by Mantle in the old Griffith Stadium park in Washington, D.C.; “Mickey Mantle Day, September 1965,” when Mantle was honored for his career at Yankee Stadium; and, “Keeps on Ticking,” featuring Mantle, among others, in Timex watch advertisements. Stories on Babe Ruth, Jimmie Fox, Christy Mathewson, Honus Wagner, Yogi Berra, and Sandy Koufax are also found at this website. Beyond those, additional stories can be found at the “Annals of Sport” category page, the Archive, or the Home Page. Thanks for visiting — and if you like what you see here, please make a donation to help support this website. Thank you. – Jack Doyle. Mickey Mantle – here in his young “Greek god” body – captured by Life magazine during a celebratory locker room scene, October 1952. Young Mickey Mantle shown here with wife Merlyn and their two young boys. They would have four sons. 1965 Life magazine photo of Mantle throwing batting helmet in frustration – but check out those forearms! Mickey Mantle winces in pain during batting practice at spring training, 1967. Maury Allen, Memories of the Mick, Taylor Publishing: Dallas, Texas, 1997, 183 pp. David Halberstam, October 1964, Villard Books, New York, 1994, 380 pp. “The Remarkable Mickey Mantle,” cover photo, and story: “A Prodigy of Power: Mickey Mantle Comes of Age As a Slugger,” Life, June 25, 1956, pp. 99-102, 105-107. “Mickey Mantle: My Knee Injury in the 1951 World Series,” YouTube.com. John R. McDermott, “Last Innings of Greatness: Playing on Bum Knees and Courage, Mantle Fades After 14 Brilliant Years,” Life, July 30, 1965, pp. 46-53. Douglas Duncan, “Mantle’s Breaks—and Yours,” Popular Science, October 1964, pp.100-103. “The Man’s Man XVII: Mickey Mantle,” MarshallMatlock.com, June 13, 2011. Roger Kahn, “Remembering Mickey” (cover story), The Sporting News, August 21,1995. Shirley Povich, “Mantle’s Critics Swing, Miss,” Washington Post, June 19, 1995. Note: Many of the news stories below mention Mickey Mantle injuries in their headlines, underscoring his hard times with injuries that often took him out of play. “Mantle to Miss Finale in Boston and Yanks’ Game Here Tomorrow,” New York Times, Monday, May 26, 1952, Sports, p. 28. “Mantle Rejected for Draft Again; Yanks’ Outfielder Ruled Unfit Because of Injury to Knee Suffered in ’51 Series,” New York Times, Tuesday, November 4, 1952, Sports, p. 34. Joseph M. Sheehan, “Mantle Is Lost for Final Drive; Skowron Also Sidelined by Injury Suffered Friday. . .,” New York Times, Sunday, September 18, 1955, Sports, p. 2. John Drebinger, “Ford’s 5-hitter Halts Boston, 7-1; Mantle Clouts 3-Run Homer for Yanks Before Leaving Game With Leg Injury. . .,” New York Times, Saturday, April 21, 1956, Sports, p. 12. Deans McGowen, “Mantle Injury Held Not Serious, But He’ll Be Out 2 or 3 Days; Sprained Knee Ligaments Troubling Yank Slugger; Physician Orders New Brace; Mickey’s All-Star Role in Doubt,” New York Times, Friday, July 6, 1956, p 24. “Mantle Hospitalized Five Days For Treatment of Shin Splint,” New York Times, Saturday, September 7, 1957, Sports, p. 27. John Drebinger, “Braves Have Health and Hitting; Yanks Face Series, With Doubts About Mantle, Skowron,” New York Times, Monday September 30, 1957, Sports, p. 49. Louis Effrat, “Bombers Face Prospect of Losing Mantle for Fifth Series Contest; Shoulder Injury Handicap to Star; Mantle’s Inability to Throw with Usual Strength Leads to Removal in Tenth,” New York Times, Monday, October 7, 1957, p. 31. Louis Effrat, “Mantle to Stay out of World Series Opener Unless His Condition Improves; Yankee Slugger Weak and in Pain; Club Doctor Says He Thinks Mantle Can Play, However; Houk Also Confident,”New York Times, Tuesday, October 3, 1961, p. 47. “Mantle’s Thigh Injury Expected to Sideline Him 2 to 4 Weeks; Star Center Fielder Resting Comfortably but Bombers Are Uncomfortable; Injured Mantle Out 2 to 4 Weeks,” New York Times, Sunday, May 20, 1962, Sports, p.1. “Mantle on Bench With Knee Injury; Yankee Star Doesn’t Know When He Can Play Again,” New York Times, Tuesday, July 31, 1962, Sports, p. 21. Louis Effrat, “Mantle Is Forced to Quit in Third; Injury Still Hobbles Star; Bombers Get 14 Hits off 4 Hurlers; Lopez Excels,” New York Times, Saturday, August 4, 1962, Sports, P 13. John Drebinger, “Mantle Is Hurt in 6-to-1 Victory; Yank Ace Reinjures Muscle in Side,”New York Times, Sunday, April 14, 1963, Sports, p. 167. Gordon S. White Jr., “Mantle Fractures Left Foot in Yank Victory at Baltimore; 4-3 Game Marred by Star’s Injury Mantle Crashes into Fence Chasing Oriole Homer and Will Be out a Month,” New York Times, Thursday, June 6, 1963, Sports, P. 56. Leonard Koppett, “Mantle Sidelined Indefinitely with Knee Injury; Yanks Bow to Angels, 5-0; Star Could Miss Rest of Season; Loose Cartilage in Mantle’s Knee Probable Aftermath of Foot Injury on June 5; Injuries Plague Career,” New York Times, Friday, July 26, 1963, Sports, P. 17. Leonard Koppett, “New Role for Mantle? ; Full Time as Pinch-Hitter Is Urged For Ailing Slugger of the Yankees,” New York Times, Sunday, January 23, 1966, Sports, p. 182. Leonard Koppett, “Mantle Suffers Pulled Muscle after Hitting His 475th Homer; Yankees Bow, 4-2; Mantle Injured,” New York Times, Sunday, May 15, 1966, Sports, P.1. Joseph M. Sheehan, “Mantle Suffers Injury to Left Leg as Yankees Are Beaten by Red Sox, 5-2; Bomber Slugger Is Hurt Sliding; Injury Termed Not Serious but First Baseman Will Miss Couple of Games,” New York Times, Thursday, March 23, 1967, Sports, p. 41. “Mantle Ends 18-Year, Injury-Ridden Baseball Career,” New York Times, Sunday, March 2, 1969, p.1. Lewis Early, “Mickey Mantle: Mini-Biography,” TheMick.com. Mickey Mantle 1961 Topps Baseball Cards. 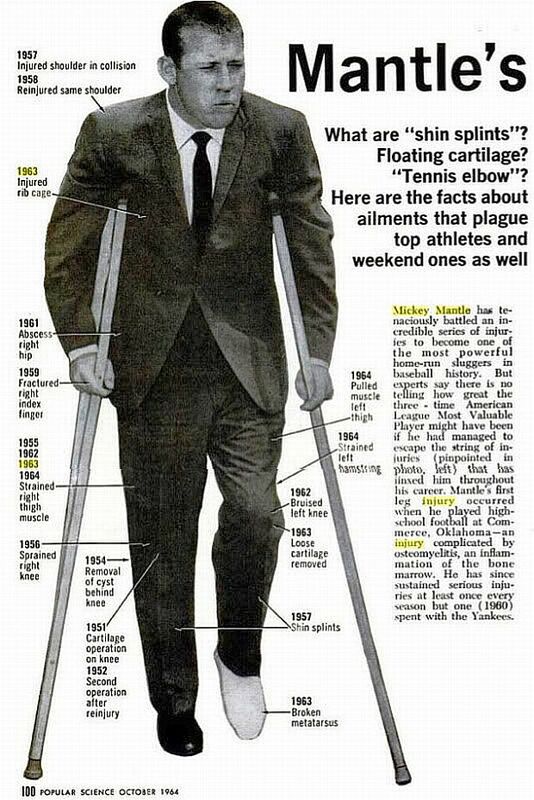 A graphic of Mickey Mantle’s injuries from:“Mantle's Breaks—and Yours,” Popular Science, October 1964, pp.100-103.